Our cute little chicks have grown into lovely young hens and just moved out of their little light-bulb cage in our garage into their very own outside coop! They were both so excited. Living in the garage must have been pretty boring, though we decided it was less heart attack-inducing than having four giant cats pounce against their cage all day. Now they have a much bigger place outside, which must be the chicken equivalent of getting your first apartment with a roommate. Now they can peck at bugs all day and sneak out to go dancing at secret chicken nightclubs in the evening. At least, that’s what I like to pretend they do. 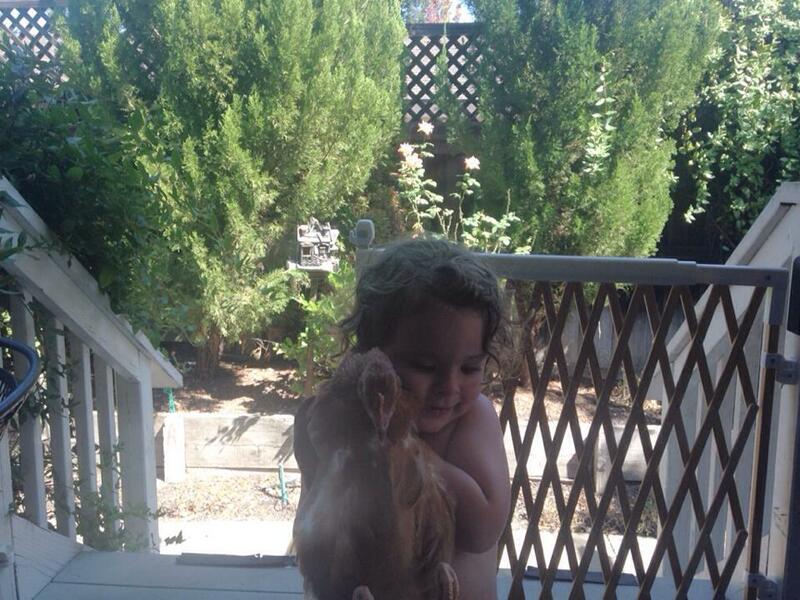 These chickens, brought to our house partly for the amusement of our children, have been held and cuddled since they were puffy little yellow cottonballs, so they are much tamer than your typical poultry. 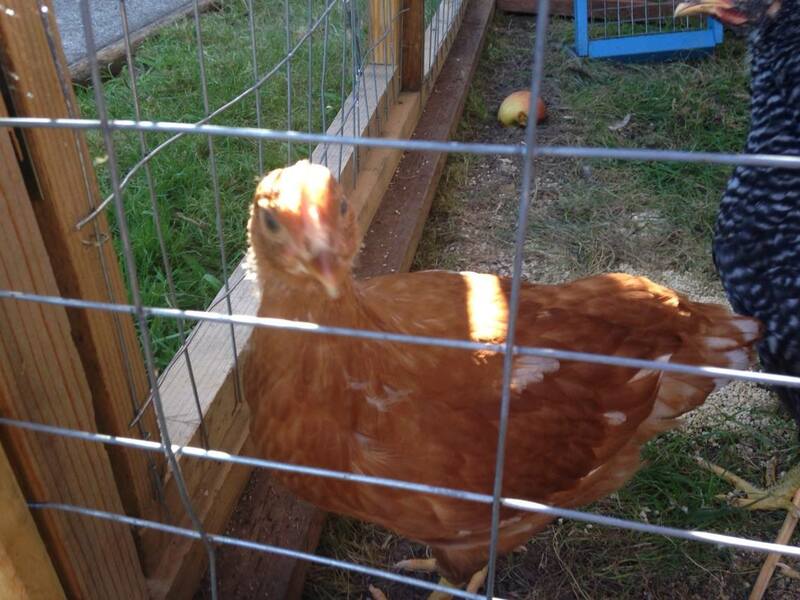 Rosie, the Rhode Island Red, appears to be the leader. Hester, the black-and-white Austrolaurp, goes ballistic whenever she loses sight of her buddy Rosie. It’s funny to think they were chosen at random out of a giant pile of unrelated chicks, but now are total BFF’s. Brontë likes to carry the chickens around the yard. Rosie and Hester follow us around the yard whenever we are outside and we pet them every day. Brontë even nuzzles their chest feathers and carries them around the yard. 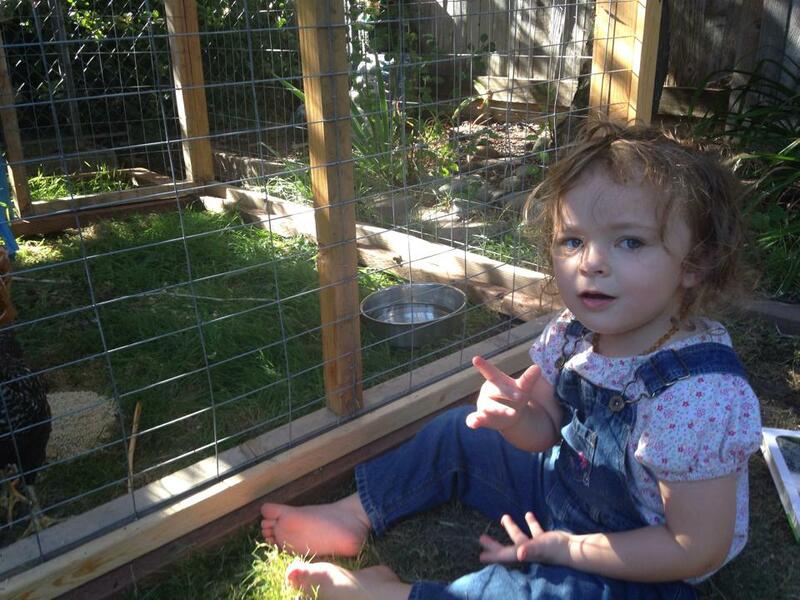 The chickens are surprisingly indulgent with her aggressive cuddling. My daughter provides light entertainment at meals. Recently, she has insisted on bringing a book with her. She helps me get chicken feed, helps scoop it into the coop, then points at the chickens and commands them: “EAT, CHICKENS!” After they start pecking, she makes herself comfortable, pulls out her book, and begins showing them the pictures while talking about the story. Since storytime is one of Brontë’s favorite things in the entire world, I figure these daily reading sessions come out of deep toddler love. Brontë is a firm believer in chicken literacy. 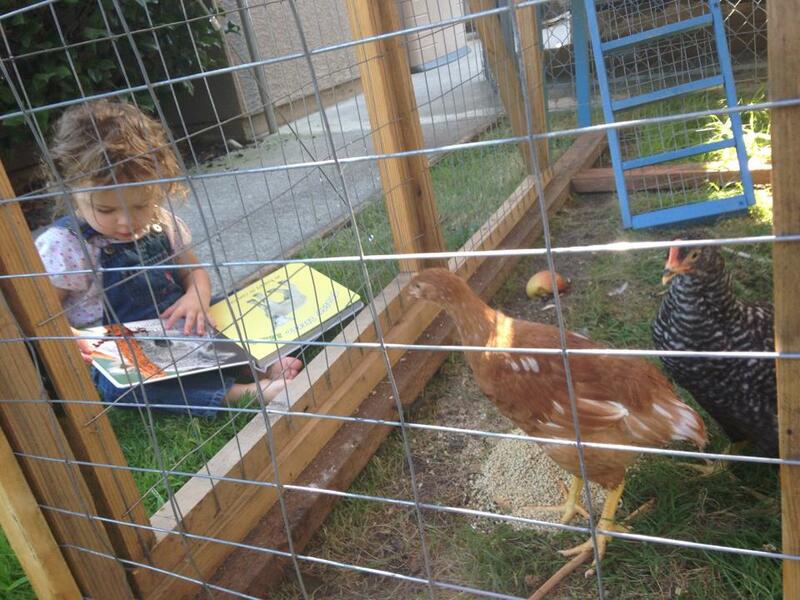 Sometimes, when Bronte gets tired of making up stories to go with the pictures, she will hand me the book and say, “READ, MOMMA!” I’ll read to them for a bit, just to humor her, but I swear the chickens look like they are paying attention. All this chicken joy and she hasn’t even seen them lay eggs yet. I try to explain how they will produce eggs for us, but she usually looks at me with the level of toddler concern that tells me she thinks I might be delusional. She is in for a fun surprise.